March is typically characterized by the old proverb, “In like a lion, out like a lamb.” This March let’s end strong and go out like lions instead. 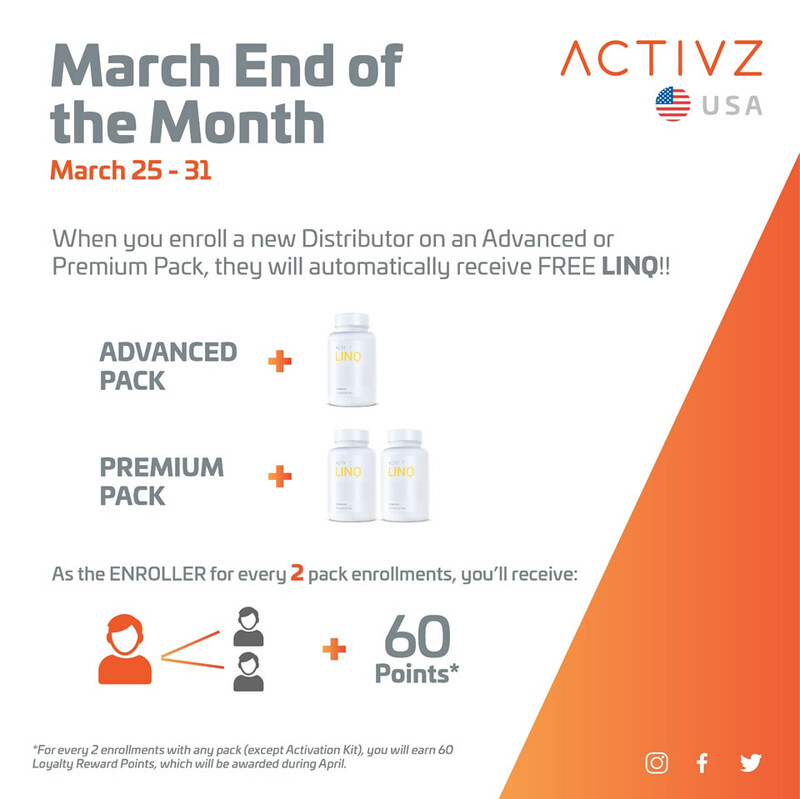 Let us hear you roar by enrolling new distributors on an Advanced or Premium pack and we’ll reward your new distributor with a free product, and you’ll get 60 rewards points for every two distributors you enroll on any pack (Activation Kit excluded). No limits. And don’t forget, all of this new volume will help you qualify for the A6 and Beyond Promotion that will bring you to the US Launch Event (MX National Training Event). This promotion is exclusive to United States & Mexico offered as separate promotions in each market. Qualifying enrollments must be entered and paid in full during the designated qualification period. New enrollments with pending payment at the end of the qualification period will not qualify. Qualifying positions are non-transferable and are only valid for those listed on the account. Enrollment packs may not be purchased by the enroller. Qualifier expressly authorizes ACTIVZ to disseminate in the media that ACTIVZ deems appropriate, whatever they may be, her or his full name, country and city of origin, likeness and in general all data that may be required for the purpose of disseminating this promotion in the media and in the manner in which ACTIVZ disposes, without the right to any compensation. Any violation of these terms and conditions or the misconduct of any prize qualifier will, at the sole discretion of ACTIVZ, result in the revocation of the winner's prize and designation as a prize winner, and all privileges related to her or his character as winner will be terminated with immediate effect. The receipt of any of the components of the prize of this promotion by the qualifier is conditioned upon prior compliance with each of the applicable requirements and in accordance with the provisions of applicable law. Each prize qualifier is responsible for any and all taxes that may be applicable to the award of the prize. Distributors in the US can enroll new distributors in Mexico and distributors in Mexico can enroll new distributors in the US and still earn rewards. Any violation of these terms and conditions or the misconduct of any prize qualifier will, at the sole discretion of ACTIVZ, result in the revocation of the winner’s prize and designation as a prize winner, and all privileges related to her or his character as winner will be terminated with immediate effect. The receipt of any of the components of the prize of this promotion by the qualifier is conditioned upon prior compliance with each of the applicable requirements and in accordance with the provisions of applicable law. Each prize qualifier is responsible for any and all taxes that may be applicable to the award of the prize.